Roberto Clemente is one of the greatest players in the history of baseball. Clemente was born on August 18, 1934 in Carolina, Puerto Rico. During high school, he was required to play on a local softball team, and from here he launched his career. Throughout his career, Clemente hit 240 home runs, and achieved a batting average of .317. He played with the Pittsburgh Pirates after a minor league season with the Brooklyn Dodgers. In 1966, while playing playing for the Pirates, Clemente was named the league's Most Valuable Player (MVP) and, in 1971 he was the MVP of the World Series. Seven years later, he became the first Latin American to be inducted into the baseball’s Hall of Fame. 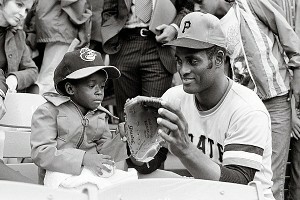 In addition to being a terrific baseball player, Clemente was also a great humanitarian. He often donated baseball equipment and supplies to the people of Puerto Rico and other Latin American countries. Sadly, New Year’s Eve of 1972, he died in a plane crash while flying to Nicaragua to help people who had been devastated by an earthquake. Roberto Clemente was an outstanding baseball player and human being. He should be remembered and celebrated for his great work, both on and off the field.